This rubber evokes memories from speed glue times! 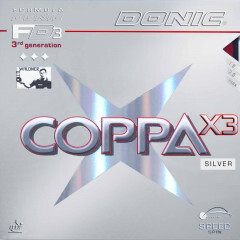 COPPA X3 mega-loud sound and easily controlled speed will provide great pleasure. This rubber offers perfect control and is suitable for an active topspin game from all positions. DONIC Coppa X3 is very easy to play with. Allround players will also find an improvement in their game. Sponge hardness: soft Playing characteristics: Very soft with superb control and a unique sound.Recommended for: Allround players who require good control plus speed. Donic Rubber Coppa X3 Silver is beeing added to cart.